F5 Networks president and CEO John McAdam spoke of the company's strong positioning in the ADC market and the new products and resources planned to expand its footprint, as the company announced its fiscal Q3 results, writes Linda Endersby. 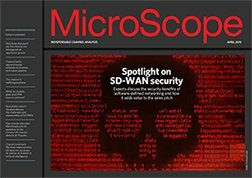 "In June we began shipping VIPRION 2400, our new chassis-based application delivery controller that offers scalable performance and other advanced features of the VIPRION architecture at a price in the mid-range of our ADC product family; we expect sales to ramp steadily over the next several quarters." In the 3rd fiscal quarter of 2011 revenue was $290.7m. This is up 26.1 per cent from $230.5 million in the third quarter of fiscal 2010. Looking forward McAdam added: "This quarter, we are on track to release version 11.0 of our TMOS operating system, which includes user-friendly application templates, support for virtual clustered multi-processing, and more than 150 new features, many of them geared toward service providers." He also stated his confidence in the firm's ability to sustain top-line growth and profitability by continuing to expand reach into new and existing markets and by hiring and retaining the best people. GAAP net income was $62.5 million ($0.77 per diluted share), compared to $40.5 million ($0.50 per diluted share) in the third quarter a year ago.